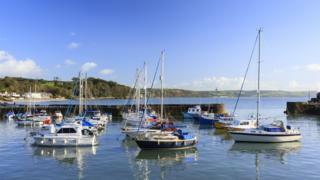 Plans to transform a Pembrokeshire harbour into a major marine tourist destination have taken another step forward. Pembrokeshire Coast National Park Authority has approved an application to build a four-storey marine centre in Saundersfoot harbour. It forms part of a multi million pound redevelopment. Planning officer, Andrew Richards, said the centre would "ensure the long term viability of the harbour." It includes marine workshops, office and retail space, teaching rooms, accommodation, a restaurant and a cafe. The national park authority's decision to approve the application is subject to there being no material objections received during the consultation period which ends on 23 June. The marine centre forms part of the second phase of the harbour's redevelopment. Previous work includes a new harbour decking area, slipway and sea wall.